Sunday to Sunday. RARE and CALM. Luxury villa ranked 3 *** ocean view. With a satisfaction rate of 94% (see the 33 appreciations below), we are delighted to welcome you for your stay: the eyes in the water! 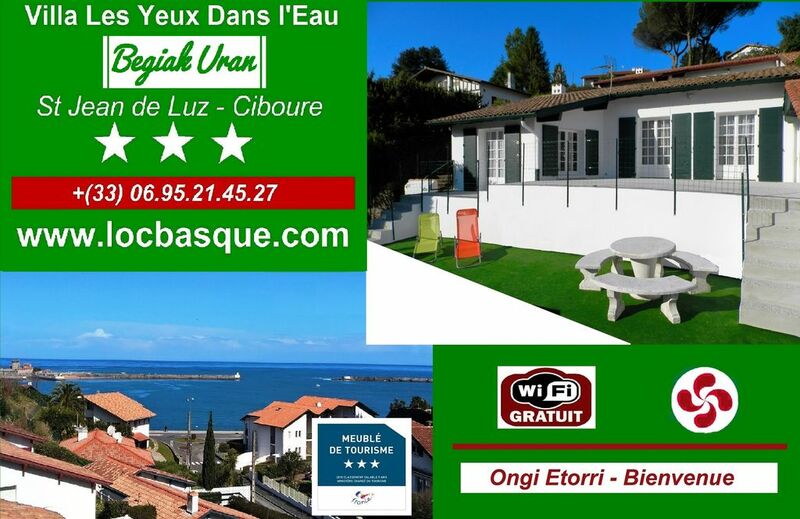 Detached house on the avenue de l'escale in Ciboure - St Jean de Luz: completely renovated in 2014. Accommodation can accommodate up to 5 people, ideal family with 3 children. -> An entrance living room with a living room, a wall led tv (80cm), with ocean views. multifunction icro-waves, hood cooking gas city ..) and can accommodate 8 guests at table always enjoying a moment meal in front of the oceanic landscape. -> A bathroom modern double basin and led mirror equipped with a large shower, hanging toilet, wall mounted hair dryer and towel dryer connected to the central heating. - a parental equipped with a bed 160 cm, a TV and DVD player, two cabinets. - one for children consisting of three folding single beds leaving space during the day to play, entertain: ideal for children. St Jean de Luz, its pedestrian street leading to the still buzzing Place Louis XIV and its seaport. Between sea and mountains, Ciboure is the charm of a small seaside resort calm nestled in the heart of a splendid bay facing Saint-Jean-de-Luz. A stay at Ciboure and Socoa rhymes with pleasures of the mouth. Renowned for the quality of its cuisine, you will find all seafood including his famous Ttorro but also all the traditional recipes of Basque cuisine ... local products you also find on the traditional market. Ciboure is also a superb 18-hole centenary golf course. Weekly rental for short stay. Pets are not allowed. Private Wifi No disabled access (stairs) House completely renovated (interior and exterior: April 2014) classified accommodation furnished with tourism 3 stars. National quality label, controlled by the same body as for hotels. We had a great stay at this villa which is perfectly located, very close to the beautiful beaches (one is only 200 m away, just at the bottom of the street, and the next just 600 m), but also not far from the town centres of Ciboure/Socoa and St-Jean-de-Luz with bakeries, shops and restaurants (all in walking distance). The view from the large terrace is wonderful! We really enjoyed it. bonne situation très proche plage et vue magnifique. Que de bonnes choses, tant pour l'accueil que pour la villa.. Au plaisir de vous accueillir de nouveau lors d'un prochain projet de séjour. Agréable accueil personnalisé, villa moderne et agréable. bon séjour, je recommande ! National quality label, controlled by the same organization as for hotels. St Jean de Luz, its rue Piètonne leading to the Place Louis XIV and its seaport. Between sea and mountains, Ciboure is the charm of a small Basque resort nestled in a beautiful bay facing Saint-Jean-de-Luz. Ciboure is also a superb 18 hole golf course centenary.